India’s resource problems are not those of scarcity, but rather of inefficient use and bureaucratic policies. The question of sustainability is becoming ever more plain in the prime food-growing states of northern India, as well as in the coal-producing energy states to the southeast. Because so much of India’s grain is irrigated with groundwater that requires millions of electricity-consuming pumps, it is widely known that food abundance is depleting groundwater reserves, evidence of which can be monitored and charted from space. 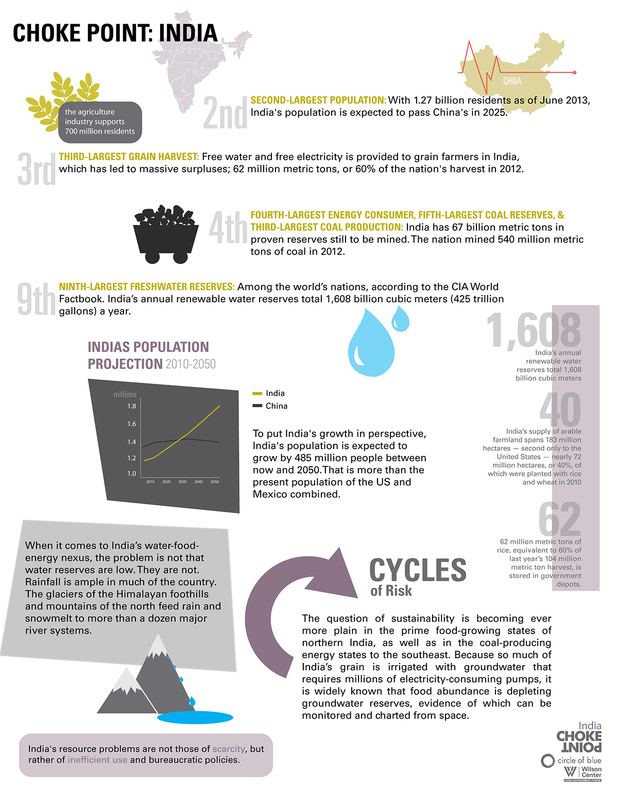 The infographic below explores India’s relevant resource abundance and reasons for increasing scarcity. Choke Point: India Infographic — India has abundant resources. The nation has the world’s fifth-largest coal reserves, ninth-largest water resources, and produces the world’s third-largest grain harvests. But increases in population and bureaucratic policies are causing choke points around these resources. Click image to enlarge. Laura Stegmeyer is an undergraduate student at Grand Valley State University and a design intern for Circle of Blue. This infographic accompanies an article by Circle of Blue’s senior editor, Keith Schneider: Choke Point: India — The Leopard In The Well. First of all, thanks for the infographic. I’ve published it in Infographics Village with proper credit to Circle of Blue and Laura Stegmeyer. I have no clue what the article Leopard in the Wall is all about, but what I believe that the crises in India isn’t a bureaucratic problem, rather a political problem. The political class should shoulder the moral responsibility, as they do operate the bureaucrats over there. They are the prime force out there and outperform the bureaucrats in every possible ways.